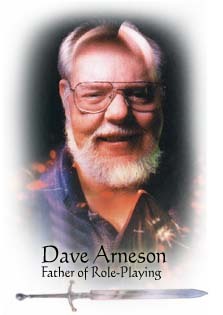 The Second Annual Dave Arneson Memorial Gameday (NYC Branch) was a rousing success, and a great conclusion to TARGA’s International Traditional Gaming Week. Having been out to Gary Con at the start of the ITGW and then organized four different games for the Gameday (plus helping put together fifth table of George Strayton’s 4E conversion of Temple of the Frog when the first one filled up) leaves me with a lot of ordinary day job stuff to catch up with, so I’ll let other people’s posts tell most of the story. I got to be a magic user with plate mail and sword. A novelty. Not that he could wield that sword to save his life. At will Lightning bolts and fireballs was also nice. I got to strangle people with their own hair, save amazonian babies and get a sh*t load of gold. Unheard of in any other ‘early edition’ I’ve played. Oh and the amazonians were played by, well, an amazonian. Seriously, she must have been 6 foot tall. My Amazon ringer was weisse_rose, the intrepid player of Lydio the Spider Dwarf in the White Box campaign, who very kindly agreed to be typecast when she fortuitously arrived right after the dice told me that the 11 warriors right next to the room of the giant frogs were all women. I decided that they were survivors of the destruction of the Temple of the Frog, so their “babies” in need of rescuing were carnivorous frogs bred to take over the world. Whether this juxtaposition of maternal affection and razor-sharp batrachaian teeth also counts as typecasting is for more enlightened observers to determine: I’m just glad that the “you meet one or more females in a dungeon” scenario didn’t end in violent betrayal as usual, perhaps because weisse_rose’s PC glow smoothed over that little misunderstanding about the man-eating pony-sized babies. In short: it was awesome. There was quite a turnout, so much so that at times it was hard to hear over all the other games. Tavis ran a great game with lots of creative takes on the old Blackmoor dungeon and he did a magnificent job of debuting the Dragons at Dawn rules I put together. There were eight of us playing and every class from the ruleset was represnted except “Sage”. I was particularly impressed with the Merchant character and how well that was played as well as other characters clever use of their stats like “Appearance” in gaming situations. The group made it past the Elves using some fast talking and slight of hand and found our way into the dungeon. There were encounters with some intimidating undead, a lot of passage exploration and secret doors and some not always successful negotiating with the bad guys encountered. We did strike up an alliance with some warrior women on the third level and had just gotten into a fight with some theurgistists when unfortunately I had to leave to catch the bus back to Schenectady. All in all the event was an excellent tribute to Arneson and kudos to Tavis for organizing it. “I seek an audience with Sir Fang,” says Ed. “I am an expert in poetry and literature,” Ed replies confidently. It was an great moment for Ed and sages everywhere, and word has it that becoming a vampire is Ed’s eternal goal as a player so I’m glad to have seen it fulfilled! One interesting thing was that the group really focused on Sir Fang, I guess because they had heard from the elves that he was the reason they were making everyone drink holy water etc. before entering the dungeon. I’d worried about how huge and open-ended the dungeon was, making pacing difficult for a one-shot four-hour game, but the initial mention of Sir Fang proved to be a powerful nudge that beautifully set up Ed Vainglor’s vampire apothesis as one climax to the session. Eric’s memorable character Bloodgrave, cleric of the Starving God and wearer of the futurisitic battle armor and shield from the Temple of the Frog, was also all in favor of seeking out Sir Fang, but it’s probably for the best that their choices of the many, many possible directions for exploration led them to the set of rooms that created the interesting Amazonian plot and enabled another great Arnesonian climax: helping return frog-babies to their loving warrior-mommies, while burdened with 260 lbs. of gold apiece. I didn’t manage to kill any PCs, but I did get a rarer privilege for a DM: having a player who was new to roleplaying! He’d learned about tabletop gaming from the Robot Chicken and Penny Arcade actual-play podcasts, and I was honored that the Arneson Memorial Gameday provided an opportunity for him to see what it was all about. He went out to dinner afterwards with Joe_the_lawyer and some of the players from his Castle Zagyg game, and it was great to see him swapping war stories just like an old-timer. The birth of a new gamer is a glorious thing, and less dangerous to witness than the birth of a giant carnivorous frog. My very amateurish video of the Gameday can be downloaded from drop.io. The first shows the players in my Blackmoor Dungeons event, and the cover of the Dragons at Dawn rules we were using as a recreation of Arneson’s early ’70s proto-D&D. The second video tours Mark’s Pallid Plague, then Joe’s Castle Zagyg, then George’s Temple of the Frog. P.S. A Chicagoan I met at Gary Con II told me that the Comeback Inn, the famous tavern detailed in Arneson’s First Fantasy Campaign and shown in the inset map above, was based on a real pub of the same name in Melrose Park that Dave used to visit.